Presenting, a romantic twist on a classic dessert – tiramisu crepe cake. It’s a work of patience, patience, and more patience. Making this cake was a huge pleasure for me though; by flipping over layer after layer of crepes, I had lots of alone time in the kitchen to ponder on life (lol, jk, or not). Take this as a chance to think about all the little things and perhaps your own dessert dreams. Maybe you won’t believe it, but I wasn’t always a big fan of desserts. Yet, Tiramisu gets me nostalgic in the best ways, because it was one of my fav childhood treats when dining out with family. 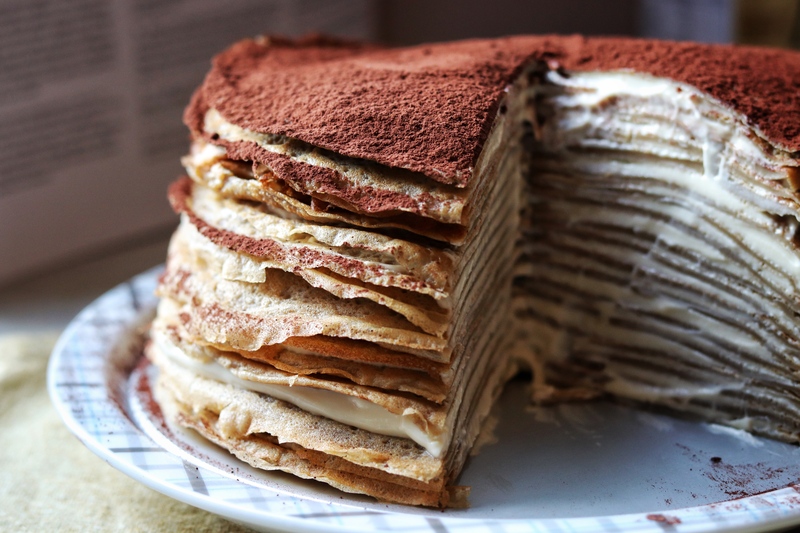 This recipe is inspired by a recipe from Tatyana’s Everyday Food, but a lot of changes have been made to ensure the crepe cake fits my own baking style. Tatyana, again, is a beloved Youtuber whose desserts never fail to amaze me. I’m so thankful that she actually was the one who pushed me to try making multi-layer cake in the first place. Prepare the filling before creating any crepes. In a large mixing bowl, add mascarpone cheese and icing sugar. Using an electric mixer, beat them on medium speed until smooth and creamy. Add heavy cream, salt, vanilla, and coffee liqueur. Continue mixing on medium speed until light and fluffy. Don’t overmix, otherwise the over-whipped cream will be grainy and stiff. Refrigerate for later use. In a second large mixing bowl prepare the crepe batter. Whisk eggs, sugar, and flour until smooth. Add coffee mixture (make sure it has already cooled down to room temperature), milk, butter, sugar, coffee liqueur, and vanilla. Combine well until no lumps can be seen. Heat a nonstick pan over medium heat. Pour 1/4 cup batter into center of the pan; swirl pan to evenly coat the entire base with batter. Cook for about 1 minute or until the edge can be easily lifted with a spatula. Flip crepe; cook for another 20 seconds. Transfer to a large plate to cool. Repeat with remaining batter. The batter should be enough to make 18-20 crepes. Remember to cool the crepes completely before assembling the cake. When both the filling and crepes are completely cooled, prepare components for assembly. Place a crepe onto a flat surface as your crepe cake base. Drop 1/4 cup filling onto this base and spread the filling evenly to almost the edges. Continue this process with remaining crepes and filling, leaving the last crepe with no filling. Sprinkle cocoa powder on top of the cake. Cover the crepe cake with plastic wrap or put it in an airtight container. Refrigerate for at least 4 hours or preferably overnight to let the cake set nicely. Enjoy! Look like beautiful shale(sedimentary rock) found in Tung Ping Chau of Hong Kong. So grand and you cannot resist eating it immediately! Wow! This looks amazing! I love Tiramisu. it’s such a wonderful flavour!